Check the old school case candy! Gotta be a poke chop sangwich in there somewhere! Seller: rodsville 100% - 1000+ fb's, and other gear listed. That lower photo is suitable for framing-- talk about serious classic vibes! Just wait'll ya soak in the story! 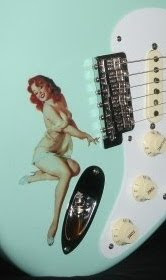 "This is an amazing 1 owner original 1960 Fender Stratocaster in beautiful condition. Guitars History: Guitar was bought from Wally's Radio in November of 1960 for 249.00 and put on layaway by original owner paying 5.00 a month. Owner decided to make a case rather than pay any more and built the hard case pictured with turquoise lining. The neck is razor straight, original frets, still has flatwound strings on it. Fingerboard is what everyone hopes to find on an old guitar like this. Amazing. Owner played in a German polka band for years and decided it's too much to worry about these days. He changed the two rear pickups and put a brass bridge on it, but all the original parts are pictured and included in auction. Questions: 979-277-9406 or email. I would buy this is a heartbeat but I'm not a strat player and thought I'd help my friend out selling it. I feel honored to help sell this amazing piece. Everything internally is original except as stated on pickups and bridge which are included in auction. This is a 3 tone faded sunburst. Color is beautiful. I've shot different kinds of shots to expose and feature and such to it's fullest. Buyer can make arrangements after close of auction of shipping. I ship Fedex, insured. Please disregard shipping fees. Actual shipping fees will be calculated to specific buyers location a choice of shippers etc. Only actual shipping prices will be charged. Thanks for looking. My bathroom scale reads in at about 6.7 to 7 pounds." There ya have it! Don't forget to floss now, and wipe the sauce off yo face.